I've always been a history nut. My parents wrapped me up in a historical-straight-jacket years ago so I would focus on other subjects in school. Namely Mathematics. I pulled out a whopping C+ average. I did graduate. Barely. I blame my mother. She won't take the blame for my poor math scores, but she should. From childhood, I ate at antique dining tables, used antique lanterns to light my way, put hair bands in blue Mason jars, wrapped up in 100 yr old quilts to watch Little House on the Prairie, and ate mincemeat pie at Thanksgiving. Ancestry is rich--heritage is priceless. I was immersed in it from a young age and as photographs begin to surface, I could almost hear their ghosts talking. I found out my Great-Aunt Avenelle (Avenelle? There's a name for you!) married my Great Uncle George when he was fifty and she was thirty-two. He was a confirmed bachelor -- who got unconfirmed. She had the aggressiveness of a German suffragette. Avenelle taught George how to drive a Model T when he was fifty-three and finally summoned the courage. My Grampa's history was more tragic. Born, one of six, (pictured on the bottom of the two-man trapeze), he watched his father drown in a canoe as he stood on the store as a boy. Three years later, his mother died of pneumonia, and they say, grief. 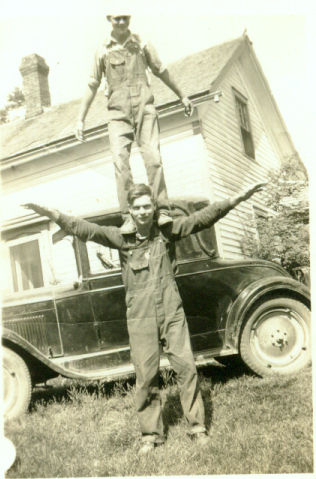 Social Services of the time (early 30's), wanted to farm the kids out, but my Grampa and his brother were determined to stay together. They dropped out of school, farmed, raised two younger brothers and two little sisters, and pioneered through life. It was World War II that finally separated them. And God blessed ... all four brothers survived. SO, can you blame me for having a C+ in math? Really? This was only the tip of the family history mountain of stories. Rich, intriguing, captivating, and most of all REAL. We love to read historical fiction for the sentiment of its era, and yet, our histories are smothered with stories of struggle, romance, adventure, and humor. Have you read your family historicals, lately? I enjoyed reading your post. I am in the process of searching my family history and keep running into road blocks on my dad's dad's dad's side. My great grandpa died young and so did his dad or so the story goes. I found out my great grandpa may have been born in prison as the person who I think is his mother was in prison for adultery. Crazy stories that are never told - that is what I want to find out about. 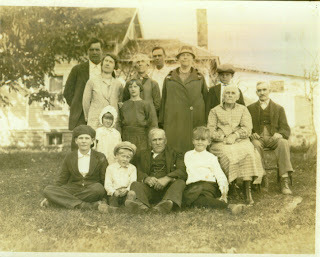 I don't know much about my ancestors past my great-grandparents. If I had the time, though, I know I could get lost in the research. That is an AMAZING family history, Angela! WOW!! Can you imagine the agony involved her situation? Sigh. Hope you can get past the road block. Best wishes! Fascinating bits of information are discovered in family historical searches. An ancestor of mine was Marmaduke VanSwearingen - who some people believe was "Blue Jacket", a Shawnee war chief. There was an outdoor drama that played for a number of years in Xenia, Ohio - which portrayed "Blue Jacket" as a white man captured by the Shawnee & made a chief of their tribe because they were so impressed by his bravery. He reportedly offered himself as their captive so that they would release his brother, he came to love them so much that he continued to live with them, by choice. Supposedly, later DNA tests from descendants of Marmaduke & "Blue Jacket" were not shown to be related - guess I will never know? Way interesting!!! My Dad was from Xenia Ohio so I've heard the story. Bethany, that is such a neat idea. One year I made a small book with a few stories from my aunts and some of my cousins. I still have those on few stories and really need them to give me some more to add to the collection. I need to encourage my mother and my aunts to write more of their memories down. I need to encourage her to do it more often! Wow what a history - no I don't think anyone would blame you for a C in math..I too prefer history...there is just more of a connection with people in the past than cold numbers. Thanks for the reminder that life is tough from the beginning and we need to trust God through it all. Funny you should ask. :) The first novel in my new series is based on the love story of my great-grandparents. I love history and especially gleaning bits of family history. My sister, cousins, and I have done a lot of research and it's been fun finding clues and putting them together. I have journal of my grandfather's writings and it is a treasure. We now have three scrapbooks of family history that are in my safekeeping as the oldest of the grandchildren. My great-grandfather was a POW in a Yankee prison and was released just after the surrender at Appomattox. We've been to the town where he lived and to the church where he and my great-grandmother married. We visited the gravesite of his mother and several of his brothers at that church. An awesome experience. Wow! Such great history Martha!!! And neat that you're basing your novel on it! Precious. Wow! Great post! Funny, when I was in school I hated history and loved math. LOL Now, I find myself loving history! I still enjoy math, but only in puzzle form now. :) I don't know about my family's historical past, but I sure enjoy reading about others. I can never claim to enjoying math but I'm truly glad you've joined us on the "dark side" -- history lovers are weird but we have a lot of fun! Family memories are priceless, aren't they? Jojo, I love that your hubby has made history come alive for you! The people is what makes history so interesting. Everything else may change: the geographical locations we live in, our mode of transportation, our type of dress, our politics, our values, but God created man (and woman :) thousands of years ago, and all these years later, humans are basically still the same. That's what intrigues me about history. The people. The how. The why. And the what if? OH my goodness, that is quite the history!! I love that they stayed together and raised each other - what a strong family legacy to have. :) Thanks for telling us! Thx Susan. My Grampa was a STRONG man ... amazing the legacy our grandparents leave behind. The era of shift from the Old West into the New Age of automobiles is an exciting one! I know a bit about this as my grand-parents and my great-grandmother shared tidbits of the transitions with me, as my great-grandmother lived hinged between the 19th and 20th centuries! And, in Chicago in the early 1900s whilst my grandparents were courting and marrying, they still had wagons delivering fruit, veg, and ice which I know firsthand as it was a family trade! *I had forgotten they delievered coal, too! I'd be keen to see where your stories take us, as you illuminate these transitions to an era we live in now that is a bit distanced from the life of my grandparents! I wonder if others' grew up hearing the stories that I did!? To where, you nearly felt you were back there, breathing in the hay and dealing with the challenges of 'on time' deliveries?! I truly loved getting caught up in your personal histories!! Anything surprising being discovered as you trace your roots!? Jorie, that's awesome!!! What a great journey you're on as you explore your family. Isn't it crazy what we find?